This album has not been included in the Paul McCartney remaster series, and it is now only available for ridiculous prices. A pity as it is a rather pleasant pre-big rock band Wings outing. Dating from 1972, and like his first two solo albums, it sees Paul McCartney just messing around a bit, enjoying himself, as the first two tracks, “Mumbo” and “Bip Bop” show. They are just jams, really, but enjoyable ones at that. The organ/backing vocal riff from “Mumbo” is surely taken, magpie-style, from Sly & The Family Stone’s 1968 track “Soul Clappin’”, however. “Bip Bop” has a nice bass backing rhythm throughout. Then we get the quite convincing reggae of “Love Is Strange” (a cover of an old hit from 1957). It is one of my favourites of McCartney’s. 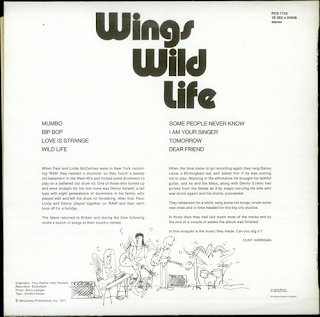 I would always put this in a “best of Wings” compilation. 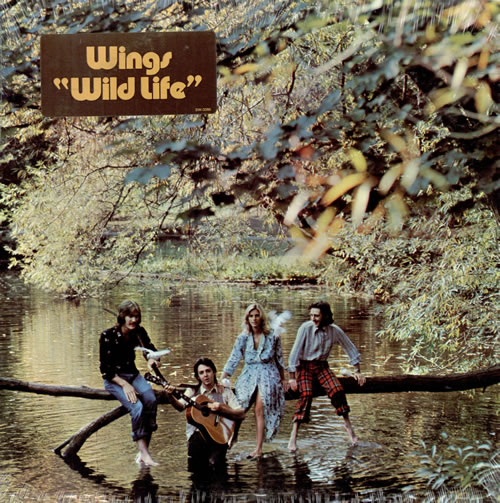 “Wild Life” has more than a hint of Crosby, Stills, Nash and Young’s “Almost Cut My Hair” about it. A six minute impassioned song in support of the rights of animals, always one of his causes. “Some People Never Know” is a beautiful, late Beatles-ish laid back song, nothing wrong with it whatsoever. If it had appeared on “The White Album”, people would have hailed it is a work of genius. It was fashionable to turn on McCartney now, however. Funny how things had changed. “l Am Your Singer” is certainly not the best song he ever wrote, but it is innocent enough I suppose, as he goes “back to basics”. Again it is nowhere near as bad a song as some would have you believe. Nice flute part there too. “Tomorrow” is a song similar to many that Wings would put out over the next six or seven years. Nice harmonies in it. McCartney’s voice now sounded like his Wings voice, which was actually quite different to his Beatles voice, I think. Some lovely backing vocals and melodic, quiet bass on this most pleasant song. Finally, “Dear Friend” is his moving attempt to smooth things over with John Lennon after a few years of sniping at each other in song. Rather reasonable of him, actually. It’s a nice song too. Genuinely sensitive. Nice saxophone/piano/strings ending. Rather sad, though, that McCartney always seemed sensitive in his songs directed at Lennon, whereas the latter was acerbic and scathing in his often puerile, needless attacks on McCartney. The sound on the 1993 remaster is perfectly acceptable. There is a real laid back pleasure to this album. Most enjoyable. Just enjoy it for what it is. It is no “Band On The Run”, of course, the key is not expect it to be. At the time it was critically panned, with some saying that McCartney’s songwriting was never at a lower ebb, and just when he needed to gain back respect (after the patchy “McCartney” I guess) he released this somewhat underwhelming album. Quite why McCartney needed to gain back respect is unclear to me. He was only a few years from “Abbey Road”.